Congratulations everyone! We made it through Monday! I know I’m not the only one who needs a little bit of positive motivation today, so I am linking up with Sara from Lake Shore Runner for her Tried it Tuesday. But before we get there, I want to mention that I am guest posting for Michele at The Paleo Running Momma! It was such an honor as Michele is one of the first bloggers I started reading a few years back! I discuss tips and tricks for gaining speed, and am sharing one of my favorite speed workouts, so head on over and check it out! Alright, now back to things I tried… Homemade Vegan Cheesey Rice! So I have been investigating alternative options to cheese since I think dairy plays a huge role in my GI issues. So welcome vegan cheese. Four simple ingredients, and while it’s not my favorite Kraft Mac & Cheese cheese, it’s pretty good! Mix ¾ cup unsweetened, original almond milk, 6 tbsp. nutritional yeast, 1 tbsp. paprika, and sea salt to taste. Whisk together and add to desired dish. I added it to Trader Joe’s organic rice cauliflower, but it would be great with pasta or quinoa. I promise it tastes a lot better than it looks! With minimal and simple ingredients, it is a quick, delicious, and filling meal! What was the last meal you experimented with? What’s your favorite comfort food? Kraft Mac & Cheese, I could and would still eat an entire box straight out of the pot! That looks surprisingly good and I never knew that rice cauliflower existed. I will definitely be adding that to my cart next TJs trip 🙂 I experimented with homemade Lara bars–I made chocolate coconut bars this weekend which were delicious!! Can’t wait to read your tips! If I can get half your speed I’ll be happy. I was just at TJ’s last night and should have picked this up…grrr. It actually does look good to me! Thanks for the idea 🙂 I love experimenting in the kitchen! I’d say my favorite comfort meal is anything German..makes me feel happy and connected to my roots! This was definitely a bit outside my comfort zone but it was so worth it I love it!! I have all of the ingredients and still never made vegan cheese. But it sounds like a good idea to add it to some cauliflower rice – so I might have to give it a shot! I’ve been trying to find nutritional yeast in the stores in my area and no one has it! ugh! Although I’ve not been doing a good job lately, I try to limit my dairy and it seems to help a lot of issues I have! I’ll have to check out this recipe! I find that my GI issues are much less, and I have clearer skin with I limit my dairy intake. Let me know what you think! Sounds good to me! I haven’t made cauliflower rice yet, but I should because I like cauliflower crust pizzas and cauliflower mashed potatoes. I love mac and cheese! But I can eat a whole box these days and it’s not nearly filling enough. Stupid running! LOL. Can’t wait to check out your tips! I want to be fast tooooo!! This is awesome! Im a huge dairy lover, but when my son was born I was off dairy and soy because he had an allergy (that he thankfully grew out of!!) Wish I had this then!! I need to try cauliflower rice. I need to find more side dishes that aren’t awful for me. I’m glad I’m not the only one who has ever eaten a whole box of Kraft Mac N Cheese. Oh… at least one box of mac and cheese… straight out of the pan. I have no shame. I make a mean skinny girl GF mac n cheese!! I can’t do the kraft, girl. I would shame my ancestors. hahaha but that cauli rice you made sounds awesome! Enjoy! I avoid dairy as well, so I’ll have to try this!!! I sure will! I do make my own cauliflower rice, as I haven’t seen it boxed. I’ll definitely keep an eye out for it! I am a cheese lover but with you on the dairy + Crohn’s but now I must try this out! This looks so good! Do you read Minimalist Baker at all? She has some killer vegan mac and cheese recipes. I love cheese and don’t have GI issues with it, but I’ve really been wanting to try nutritional yeast as a healthier alternative. 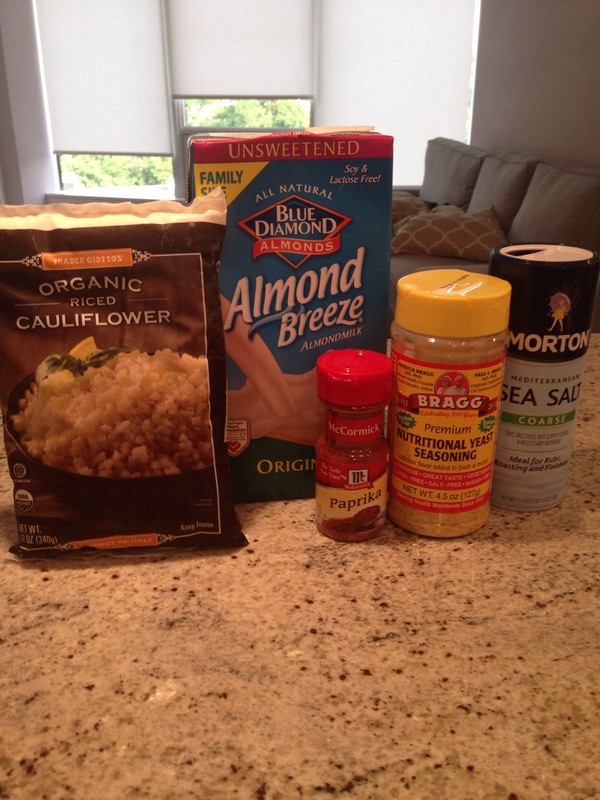 I just started cooking with nutritional yeast – so fun! Oh my gosh – Kraft brings back so many memories! When we were little, we would have Kraft + chocolate milk or Digiorno Pizza and chocolate milk for when the parents were out and a babysitter was in charge. I can just taste it now! Mac & cheese is such great comfort food. I’m not a fan of cauliflower but with regular rice, that recipe looks pretty tasty. This looks absolutely amazing – bookmarking! I have never done a cheese substitution before. Excited to try it out 🙂 Thanks for linking up. Next time, try the same cheese sauce but with chickpeas and quinoa. It is comfort to the max!!! I’d say my favorite comfort food is PB&J. That or chickpea and avocado salad. I love that together! I’ve never had nutritional yeast before, but I may have too, this looks delicious! My fave comfort food is a great big grilled cheese. Or anything with gravy like a hot turkey sandwich. 🙂 I haven’t been very experimental with my meals lately though. Minimal and simple works for me though! Vegan Cheese is my new love language!!! Thanks for the tip on rice cauliflower! I will pick that up on my next trip to TJ’s! Vegan cheese? That’s sound interesting and rather delicious! I’ll have to try that one. And, I’d have to say that a big juicy cheeseburger always makes me feel right at home.